She cements her opposition to the Affordable Care Act repeal after the Congressional Budget Office says it would leave millions more uninsured. Maine Sen. Susan Collins likely drove a stake through the latest Republican effort to repeal the Affordable Care Act, announcing Monday that she’s a firm “no” vote on the Graham-Cassidy bill. “Sweeping reforms to our health care system and to Medicaid can’t be done well in a compressed time frame, especially when the actual bill is a moving target. (On Monday), we find out that there is now a fourth version of the Graham-Cassidy proposal, which is as deeply flawed as the previous iterations. The fact that a new version of this bill was released the very week we are supposed to vote compounds the problem,” Collins said in a written statement. Although Collins, a moderate Republican, has been telegraphing her vote for weeks – with her most strident comments against the Graham-Cassidy repeal coming Friday and over the weekend – she did not officially cement her opposition until Monday evening, when the Congressional Budget Office released its analysis saying that “millions” more would be uninsured under the bill. Collins had said she would wait for the CBO report before taking an official position. It only takes three Republican defections to derail efforts to repeal the ACA in a Senate where Republicans hold a slim 52-48 majority. Collins and Republican Sens. Lisa Murkowski of Alaska and John McCain of Arizona voted “no” July 27 on a different bill to repeal the ACA, defeating that proposal by one vote. McCain announced his opposition to Graham-Cassidy on Friday. Murkowski has made skeptical comments about the bill, but has not yet said how she would vote. A Senate vote could happen as early as Wednesday. Meanwhile, from the Republican Party’s right flank, Sen. Rand Paul of Kentucky also has said he’s opposed, but some political analysts believe Paul could reverse course because he’s opposed to the ACA and Graham-Cassidy would repeal it. However, Paul insisted Monday in media reports that he’s still a “no” vote. Collins told reporters that she made her decision despite a phone call from President Trump, The Associated Press reported. She slammed Graham-Cassidy in her statement Monday. “Expert projections show that more than $1 trillion would be taken out of the Medicaid program between the years 2020 and 2036. This would have a devastating impact to a program that has been on the books for 50 years and provides health care to our most vulnerable citizens, including disabled children and low-income seniors,” Collins said. Twenty percent of Americans approve of Graham-Cassidy, according to a CBS News poll conducted Sept. 21-24. Erika Ziller, health policy analyst with the University of Southern Maine, cheered Collins’ opposition to Graham-Cassidy. If approved, it would have devastating consequences, Ziller said. Four independent analyses from national think tanks and health policy consultants have estimated that 32 million fewer Americans would have health insurance if Graham-Cassidy passed, an outcome that runs counter to Collins’ stated goal of increasing the number of Americans with health coverage. Graham-Cassidy slashes Medicaid and ACA funding. About 20 million Americans and 80,000 Mainers have ACA insurance. “I have been really impressed with Senator Collins’ willingness to look at the data and really understand what the impacts would be for the country and for Maine residents,” Ziller said. She said states with large rural and older populations, such as Maine, would be more vulnerable to the cutbacks in Graham-Cassidy. Collins has said rural hospitals would be in danger of closing, one of her major criticisms of the bill. Republicans are trying to ram through an ACA repeal by this Saturday, Sept. 30, the expiration date of special Senate rules that would allow an ACA repeal to be done with a simple majority. After that, it would take 60 votes and the cooperation of Democrats, who uniformly oppose ACA repeal. Collins has been touting bipartisan efforts to fix the ACA, including a bill she co-sponsored with Sen. Bill Nelson, D-Florida, that would shore up the health insurance marketplace. But Republican leadership has been ignoring bipartisanship since Graham-Cassidy gained steam over the past few weeks. Maine Sen. Angus King, an independent who caucuses with Democrats and a steadfast opponent of ACA repeal, said in a written statement Monday that it’s time to return to fixing the health care law. “Why not work together – Republicans and Democrats – and find a solution to fix the ACA? Before the Graham-Cassidy legislation, we were on a path towards a bipartisan agreement that would stabilize the marketplace and protect coverage for the millions who rely on the Affordable Care Act to obtain insurance,” King said. Ed Miller, vice president of the Maine Public Health Association, which represents 600 public health workers, said Collins showed political “courage” by taking a stance against Graham-Cassidy. “We’re very pleased to see her opposition in the face of overwhelming pressure to do otherwise,” Miller said. He said the ACA contains many provisions that promote preventive medicine, such as free screenings and vaccinations, and Graham-Cassidy would have eliminated the ACA’s funding for preventive medicine. Last-minute attempts to sway Collins’ vote with additional money for Maine were unsuccessful. The Graham-Cassidy revisions unveiled Sunday night included more federal funding for Maine – widely seen as an attempt to curry favor with Collins – but that temporary funding spike would be more than offset by massive cuts to health spending in 2027. Collins said in her statement that the Maine carve-out was unpersuasive. “There has been some discussion that the new version of the bill includes additional money for my home state of Maine,” Collins said in her Monday statement. “The fact is, Maine still loses money under whichever version of the Graham-Cassidy bill we consider because the bills use what could be described as a ‘give with one hand, take with the other’ distribution model. Huge Medicaid cuts down the road more than offset any short-term influx of money. 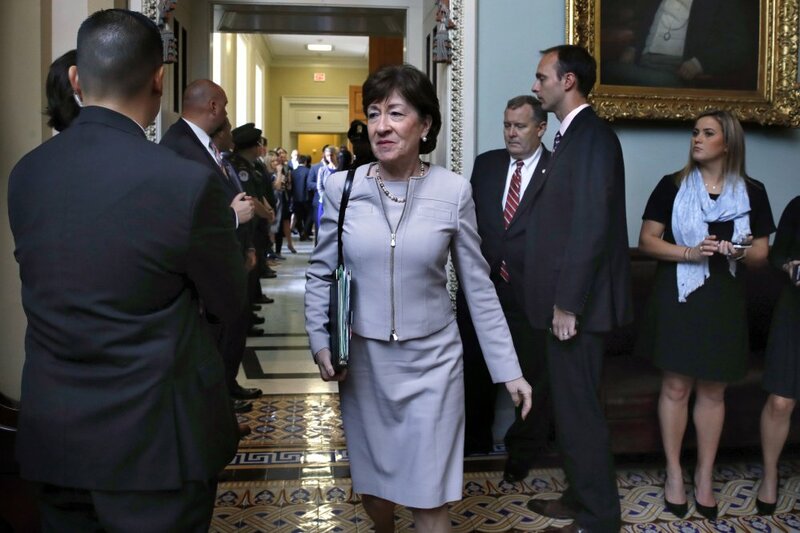 Bill co-author Sen. Bill Cassidy, R-Louisiana, told The Washington Post on Monday that he hoped the money for Maine would help persuade Collins. But Maine and every other state would lose money after 2026 – $1 billion per year for Maine, by some estimates. Included in the new provisions of the bill is a chart that shows Maine getting a 43 percent increase in federal Medicaid funding from 2020-26. But several national health policy experts roundly criticized those estimates as being inaccurate because they don’t factor in changes to the Medicaid funding formula that would result in spending cuts. Charles Gaba, a national health policy expert who writes for the ACA Signups website, wrote a blog post Sunday showing Maine would get a 14 percent net gain – $472 million – in federal funding from 2020-26. But after 2026, Graham-Cassidy removes all funding for the ACA’s health insurance marketplace and further cuts Medicaid, which would result in Maine and all other states losing billions. Maine would lose $10 billion in federal funding through 2036, according to Avalere, a Washington health policy consultant. Another health policy think tank, the Washington-based Center on Budget and Policy Priorities, pegs Maine’s annual losses at $1 billion starting in 2027. Mitchell Stein, a Maine-based independent health policy analyst, said that over the long term, “Maine and every other state would lose money by these huge funding cliffs. “It is really an insult to the American people to try to restructure one-sixth of the American economy over a weekend,” Stein said, referring to the economic impact of health care. Although the uncertainty over ACA repeal has been nearly nonstop since the spring as Congress has considered several bills to eliminate it, Maine voters will decide on whether to expand Medicaid under the ACA in a November referendum. LePage has vetoed past efforts by the Legislature to expand Medicaid, but he could not veto a voter-passed referendum. Republicans have sought to repeal the ACA for seven years, but did not have control of Congress and the presidency until 2017. Stein said Collins should be commended for not being swayed by last-minute changes to the bill.